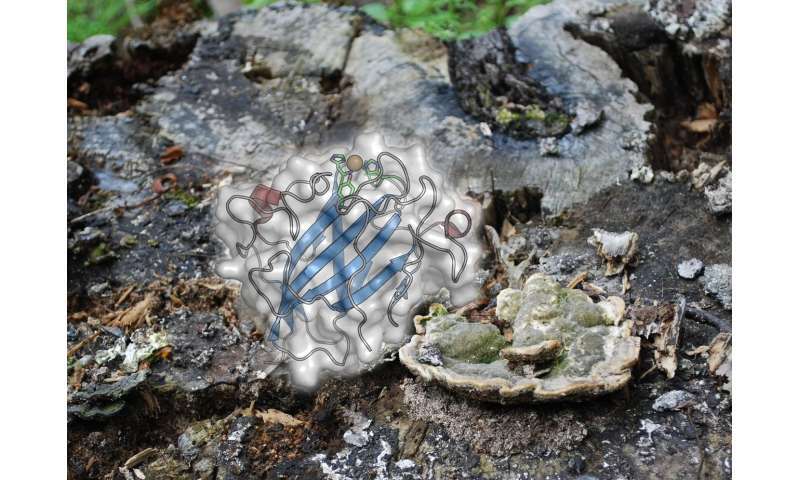 An international team of researchers, including scientists from the University of York, has discovered a set of enzymes found in fungi that are capable of breaking down one of the main components of wood. The enzymes could now potentially be used to sustainably convert wood biomass into valuable chemical commodities such as biofuels. As an alternative to coal and oil, wood is increasingly one of the more promising sources of advanced biofuels . However, despite its potential, it is a difficult material to breakdown. Current wood biorefineries have to use pre-treatment processes, making the conversion of wood into fuels and products expensive and energy-consuming. In ecosystems fungi play a significant role in breaking down wood within the carbon cycle, releasing nutrients back into soil. This property of fungi inspired the researchers to investigate the mechanisms that allow this process to take place. Co-author of the paper, Professor Paul Walton from the Department of Chemistry at the University of York said: "Back in 2010 we made the key discovery that a group of enzymes found in fungi, contain copper - these enzymes are now known to be an important component in the decomposition of biomass by biology. This research builds on that work by identifying further enzymes from this class which have the ability to break down wood's challenging molecular structure. "These enzymes may underpin the development of improved enzyme cocktails for biorefinery applications using wood - unlocking its conversion into a wide-range of valuable commodities in a sustainable way." The research, reported in Nature Chemical Biology, has shown that the family of enzymes, called lytic polysaccharide monooxygenases (LPMOs), are capable of breaking down xylans - carbohydrate molecules commonly found in wood biomass that are particularly resistant to degradation. Working in collaboration with French researchers from the Le Centre National de la Recherche Scientifique (CNRS) Marseille, the researchers isolated the enzymes from fungi that play a vital role in the terrestrial carbon cycle and dominate wood decomposition in forests. Co-author of the paper Gideon Davies from the Department of Chemistry at the University of York said: "The findings advance our knowledge of the way in which woody biomass degrades in nature. "This discovery unlocks the key scientific challenge of how biorefineries can convert wood into biofuel in an environmental and cost-effective way, bringing us a step closer to a sustainable 21st Century." Lot of Wood has been wasted continuously in Wild Fires Every year ! How come contents of guts of termites are ignored like that ? You do realize that germination of various species of trees, etc., NEED fire?